Indulge yourself in this beautiful fig and pistachio creation from my dear friend Mimi Holtz, author of her food blog Mimi Avocado . She happily shared this healthful dish for the California Fig Fest San Diego. Mimi created a lovely summer salad using California figs to make a delicious dish with couscous. Also, check out her large collection of avocado recipes that will entice you to cook and use them more often in your recipes. 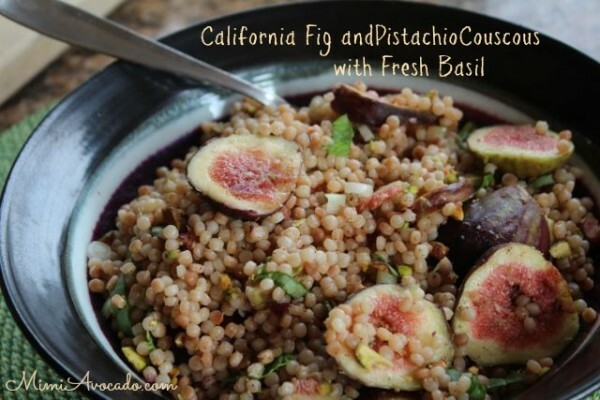 Click here for Mimi’s California Fig and Pistachio Couscous with Fresh Basil recipe. © 2013, Mary Papoulias-Platis. All rights reserved. Thanks for including my Fig Smoothie in your Fig Fest Blog Hop, Mary. This is such a wonderful festival of figs. The recipes are all so mouthwateringly inspiring. I can’t wait to get home and into the kitchen with figs and all these recipes! Hi Laura! Welcone to the fig hop! The event is this Sunday and we are posting more recipes so stay tuned! Your smoothie looks fantastic and I can’t wait to try it! Thank you for joining us!